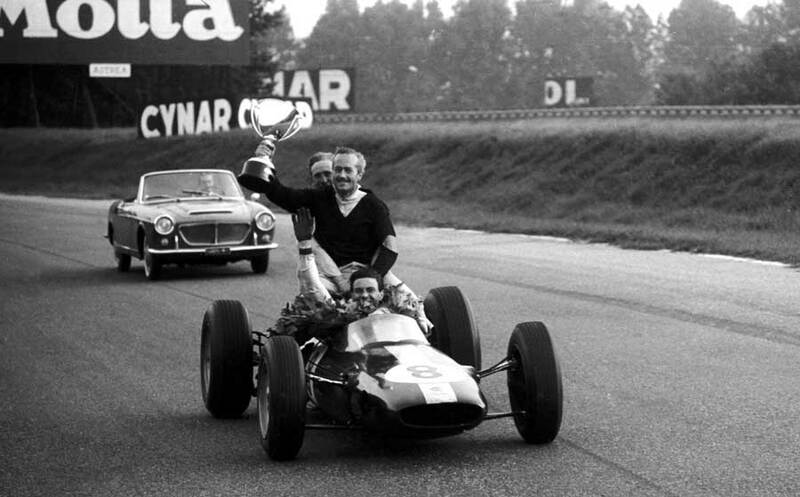 Jim Clark secured his fifth grand prix win of the season at Monza, and with it the world championship. Clark had dominated to such an extent that it was mathematically impossible for any of the other drivers to catch him, and he became the first driver to clinch the championship with three races still remaining. The Monza authorities had decided to return to the full circuit in 1963, which included the infamous banked section. However, the concrete banking was in such bad condition due to sinking foundations that, after two hours of the first practice session, the cars were stopped and the banked loop of the course was officially closed. Starting from the second row behind John Surtees and Graham Hill, Clark gave chase immediately and by the end of the first lap he was battling for the lead with Surtees, their cars barely more than a yard apart as they scorched down the pit straight. For the next 16 laps, Clark demonstrated the art of slipstreaming, sitting on the Ferrari's tail and hassling Surtees. Suddenly, on the 17th lap, the Ferrari limped into the pits with engine failure, and Clark was in the lead, but Hill, Dan Gurney and Richie Ginther were hot on his heels. Gurney eventually overhauled Clark, but the lead changed over 24 times in the first 56 laps, with Hill, Clark and Gurney all taking turns, flying down the pit straight with only inches between them. Hill then began to slow down as his BRM was suffering from clutch trouble. He held on until lap 50, but eventually had to abandon the race. Clark was now breaking lap records at will and when Gurney had to retire after a spin on lap 63, he went on to win with ease. Ginther was the only driver to finish on the same lap as the champion and Bruce McLaren came in a distant third. Having only started racing in Formula One in 1960, it was an extraordinary achievement by Clark, and he was justifiably delighted; "I had hoped to win the world drivers' championship but I did not expect to make certain of it so soon."